Introducing Cindy Rushton's NEW ULTIMATE MOMMY MENU PLANNER! Get that Kitchen Organized! You will LOVE it!! The Ultimate Mommy Menu Planner! We are SO excited to be able to introduce our NEWEST E-Book! Yep! 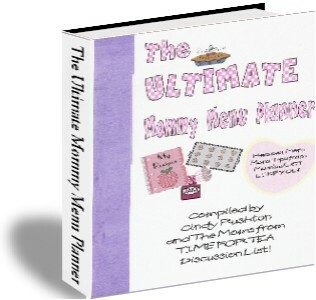 THE ULTIMATE MOMMY MENU PLANNER is now available by E-book! </p) align="center"
Bored with the same old, same old meals? Just wish you could get just ONE fresh idea? What if you could link up with over 40 other moms for menu plans...meal ideas...recipes...shopping lists...and even planner pages? Well, YOU CAN! THE ULTIMATE MOMMY MENU PLANNER includes over 280 pages full of great recipes, meal ideas, and menu plans from over 40 REAL-LIFE moms, printable planning sheets, tips sure to make managing meals easy, plus much, much more! Develop Your Own Plan for Easy Meals! Our Holiday Meal Menu Plan! Websites You're Going to Love! Printable Pages for YOUR OWN Menu Planner! How to Make Your Own Family Organizer! Quick Tips To Help Make Managing The Kitchen Easy (Well, Easier!)! So, whether you are struggling with those blank stares into the refrigerator...wondering about how to make meals more nutritious and yummy...needing some practical tips for managing your kitchen...or just needing a little help making your own menu plan, this is your book! In this book, you are guaranteed to find your ULTIMATE Mommy Menu Plans!ay! We think that you will turn to this book for years!! Did you miss getting our other HSEW E-book, LET'S GET ORGANIZED?? Well, we have a special for YOU this week! Order our ULTIMATE MOMMY MENU PLANNER E-Book AND LET'S GET ORGANIZED E-Book for $25.00! Just order HERE! We will send you both to your Email box within 24 hours! !